Paul has experienced many things in his 15 years, one of those being the death of his mother. Paul lives with his grandparents and his father is serving a life sentence for killing Paul’s mother. Paul was on the match wait list for several months. Paul’s match support specialist talked him into attending a match event geared towards waiting children and Paul was funded to go to summer camp. The couple who paid for Paul’s summer camp experience met Paul again at summer camp and became Paul’s Big Couple. The Big Couple has committed to assisting Paul with his college education and were so supportive of the AZ STARS Mentoring project that they have donated $5,000 for other children waiting for mentors to go to summer camp. Rosie has lived in and out of her mother’s custody as her mother has been in jail numerous times throughout Rosie's short 10 years of life. 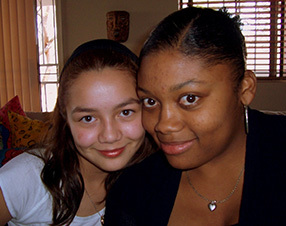 Rosie currently lives with her grandmother and was referred to the AZ STARS Mentoring Project/BBBS for a mentor. When the Match Support Specialist first met her, Rosie was quiet, kept her head hung low, and did not smile very much. Rosie was matched with her mentor and in three months she has made an incredible turn around. Rosie cannot keep from smiling. She has improved her grades, she is more talkative, and her self esteem has definitely improved. Her mentor sees her every week. Interestingly, her mentor is a police detective and they spend time at the police department. Rosie indicates that she would like to be a law enforcement officer when she grows up. Tony was reluctant to have a mentor and believed he could take care of himself; after all he was 8 years old. Tony is living with his grandmother, and both of his parents are in prison, as is his grandfather. The grandmother knew that raising an 8 year old was a lot of work for her and that Tony needed special help with his school assignments. Tony has been matched with his mentor for two months and he sees his mentor twice each week: once for fun and the other for homework help. Tony admits he is having fun in the program and he is very excited about his mentor. Steven had been on the mentor waiting list for over a year and had almost given up hope that he would ever be matched. Steven was being raised by his grandparents and had started acting out at school and in the community. His mother and father are both in prison for methamphetamine sale and manufacture. Steven had been kicked out of one public school because of his behavior and his behaviors caused concerns at other schools he was planning to transfer into. The mentor helped the grandparents find a good charter school and works with the child team, teachers, and grandparents to make certain that Steven stays in school. The mentor also assisted in getting Steven into therapy. At Steven’s one year match anniversary he showed great progress. Steven has become more mature, well mannered, and is doing well at school. Carl’s family has a long history of incarceration with his mom, two older siblings, and a maternal aunt and uncle all incarcerated. In addition, 5 older siblings have had contact with the criminal justice system. Carl’s mother went back to prison after he was matched in the AZ STARS Mentoring Project. Carl has moved several times and has lived with many relatives. The mentor knew how much seeing mom meant to Carl so he worked out the details and started taking Carl for visits. The mentor has been able to help Carl send a picture post card to mom in prison. Carl's mom was thrilled. The one year match goal was met in April 2008 and the Match was recognized at a volunteer recognition event.